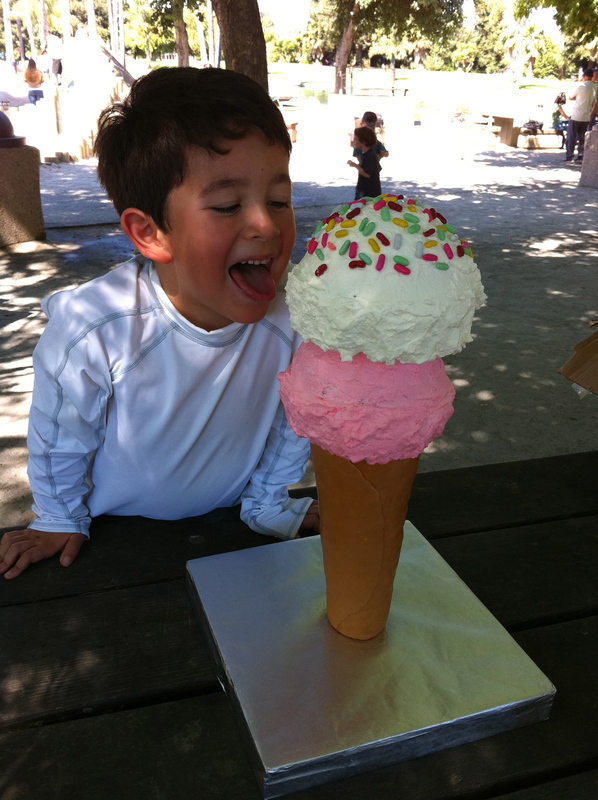 For a summer party, I decided to revisit the ice cream cone cake. The last time I made the ice cream cone cake, I used the cake as the cone and real ice cream for the ice cream. This time, I wanted to make the cone pointed, like a waffle cone, so a cake cone was out of the question. I decided to use rice krispies instead. I started by making the rice krispies treats. What I had learned from previous rice krispies experiments is that you need to cook them right if you want them to harden and not fall apart on you. To do this, cook the butter and marshmallows longer than you normally would. I think I cooked them for at least 10min. in low heat. I constantly stirred it as it bubbled so it would not burn. Then add as much rice krispies as you can…just enough to so that they are sticky but not marshmallowy. I also found spraying the sides of the pot with cooking spray helps with clean-up as it’s not as messy. Starting at the base of the dowel, press the rice krispies all the way around. Be sure to pack it in real tight since this will be carrying the weight of the cakes. Start with a small amount at the bottom and work your way up, gradually increasing the amount and size (so it resembles a waffle ice cream cone). It gets harder to pack as you go up in height, so as your packing it down, use one hand the grasp the base of the cone to retain its smaller shape. I usually do this at night so the rice krispies can harden overnight. To get that smooth, brown look of a cone, I softened a whole package of caramels and rolled it out to ~1/8-1/4″ thickness. You can use fondant, but I decided to skip the making and dyeing of it. Wrap the rolled out caramel around the cone at an angle and then trim off the excess using a knife. For the scoops of ice cream, I made a chocolate cake baked in 1/2 of a ball pan and a vanilla bean cake baked in the other 1/2 of the ball pan. Trim the flat side for easier stacking and trim the edges to shape it more like an ice cream scoop. 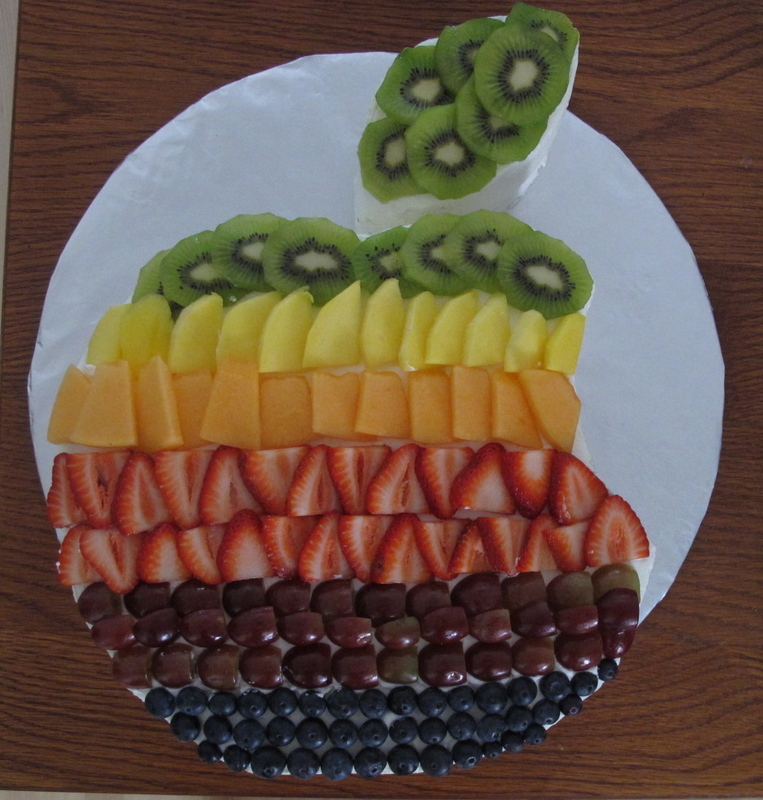 For the frosting, I wanted to keep it light since it was a summer cake. Also, I wanted it to have that ice creamy texture, so I decided to use whipped cream. I purposefully over-whipped the cream slightly to give it that rougher look. I tinted 1/2 the frosting pink and kept the other 1/2 white. Insert the cake domes through the dowels so it rests on top of the cone. Frost the cakes as usual, but add a bit more frosting at the base of the cakes and gently pat the frosting w/ the icing knife. This will give it that “ice cream scooped” look. I topped off the scoops of ice cream with some licorice pastels I bought from Cost Plus. And here is my son trying to take the first lick! So, here is a giant hot dog cake I made for a picnic. I made 2 pound cakes, 1 for the hot dog and another for the fries. I made the hot dog by baking the pound cake in a loaf pan. I first cut out the hot dog by cutting the loaf length-wise and top down, about 3/4″-1″ from the edges. 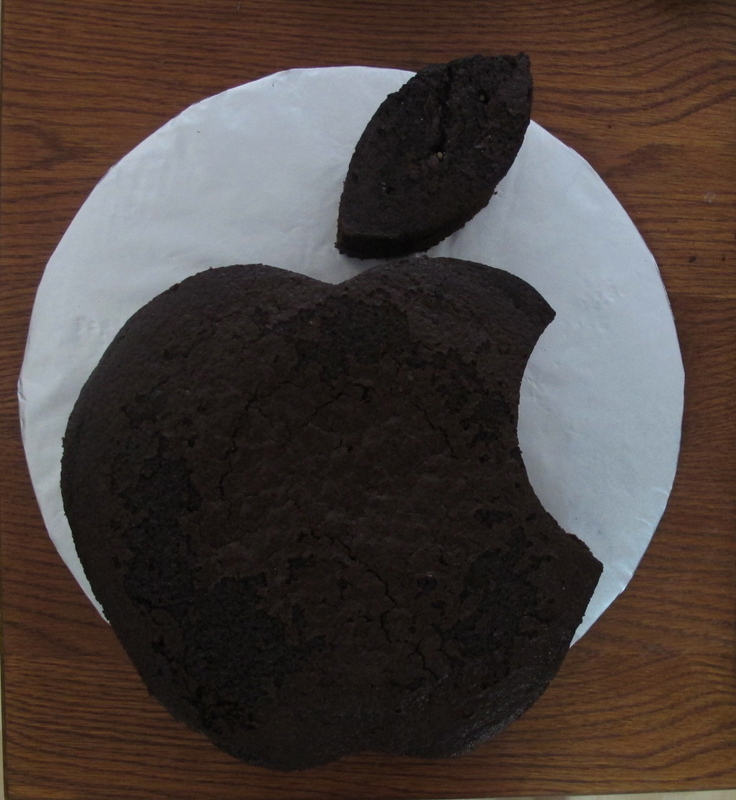 I stopped the cut about 1″ from the bottom of the cake. I then took a bread knife and cut through the cake to create a rectangle. I removed the rectangle from the rest of the cake and trimmed it down to look like a hot dog. I then trimmed the rest of the cake to look like a hot dog bun by rounding out the corners. Because the pound cake is very rich and dense, I decided to use whipped cream for frosting. I thought a buttercream or cream cheese frosting would be just too much, so opted for a lighter frosting, which worked well. Set aside a small amount of frosting for the mustard. For the remaining frosting, tint 1/2 with a light brown color and the other 1/2 with an orange/red frosting. I frosted the bun and hot dog separately. To create the grill marks on the hot dog, I gently imprinted a round chop stick tinted with black gel food coloring on the hot dog at a diagonal. After decorating both the bun and hot dog, carefully lift the hot dog on the underside, using the long bread knife. Gently place the hot dog inside the bun and re-frost areas where frosting colors may have been mixed during the process. Pipe the “mustard” on top of the hot dog. I tried creating ketchup with the whip cream frosting, but that didn’t work out too well as it was difficult to get the deep red color. 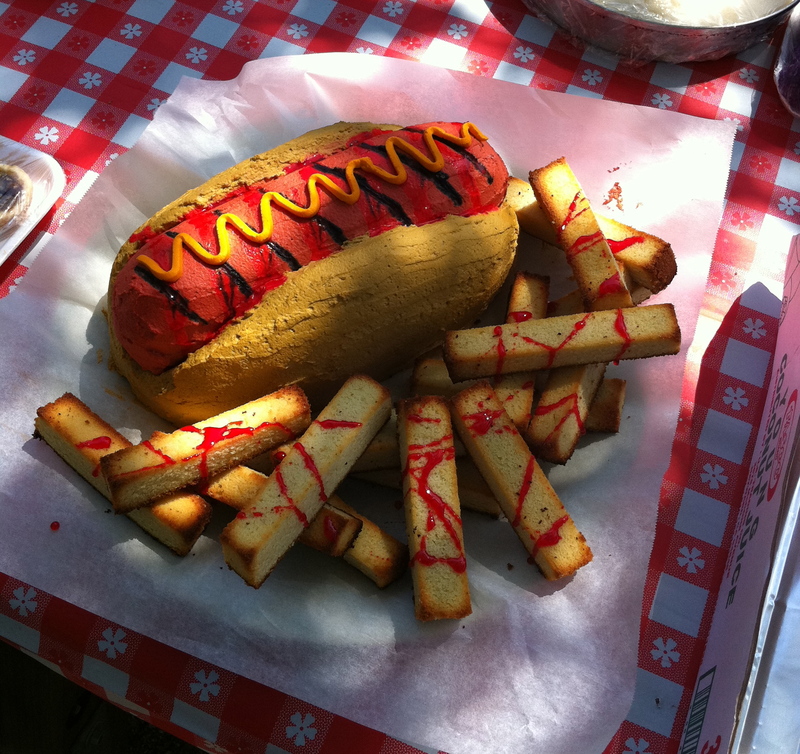 Instead, I tinted corn syrup with red food coloring and drizzled that over the hot dog and fries. For the fries, I cut the other pound cake into strips and lightly toasted them in the oven to give them a more golden/brown color.